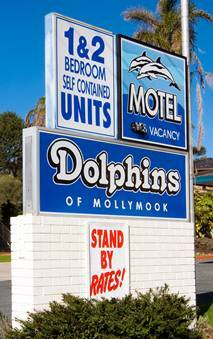 Dolphins of Mollymook Motel has ten spacious executive motel rooms and is suitable for both short and long stays. We are only 100 meters from Mollymook Golf Club and 200 from beautiful Mollymook Beach. All rooms have comfortable queen-sized beds and some rooms have one or two additional single beds. All rooms have kitchenettes with a microwave, tea and coffee making facilities, toaster, bar fridge, crockery and cutlery. The motel also has four self-contained villa apartments, each with a queen-sized bed in the bedroom and an additional sofa bed in the lounge. The apartments feature an ensuite bathroom, kitchen with full-sized refrigerator, microwave, cook top, lounge/dining area, a private balcony and air-conditioning. Dolphins also offers a Spa suite with a queen-sized bed for those romantic getaways. 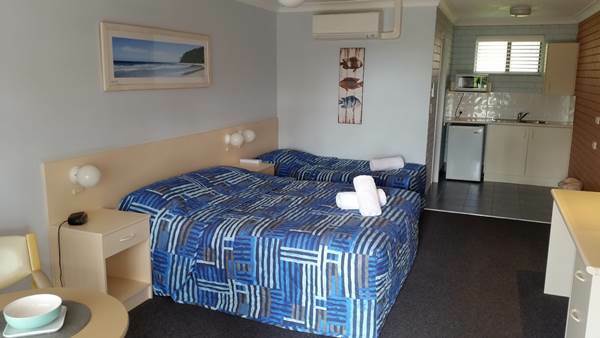 We pride ourselves on the immaculate presentation of every room for our guests, a friendly welcome and in offering the best value at Mollymook Beach.